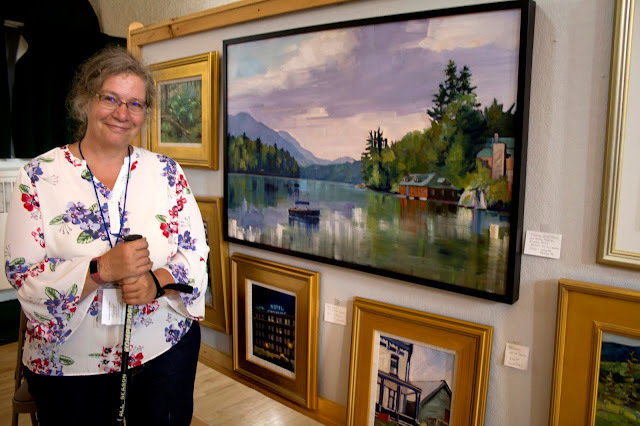 During the third week of August, fifty artists from across the country moved in to make their home here in Saranac Lake, taking part in one of the town's spectacular annual events, the Adirondack Plein Air Festival. 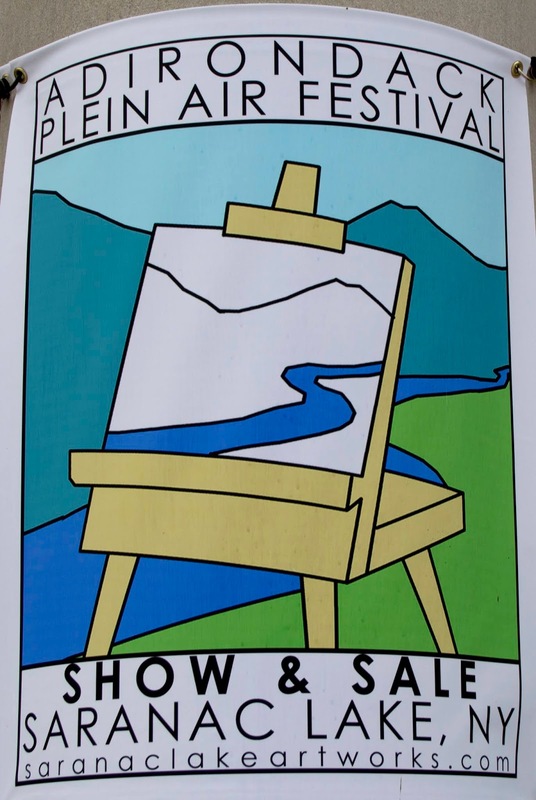 And once the week began artists were everywhere, spread out and set up before any one of hundreds of captivating scenes in and around town, bringing their talent and ability to capture what is before their eyes and senses. 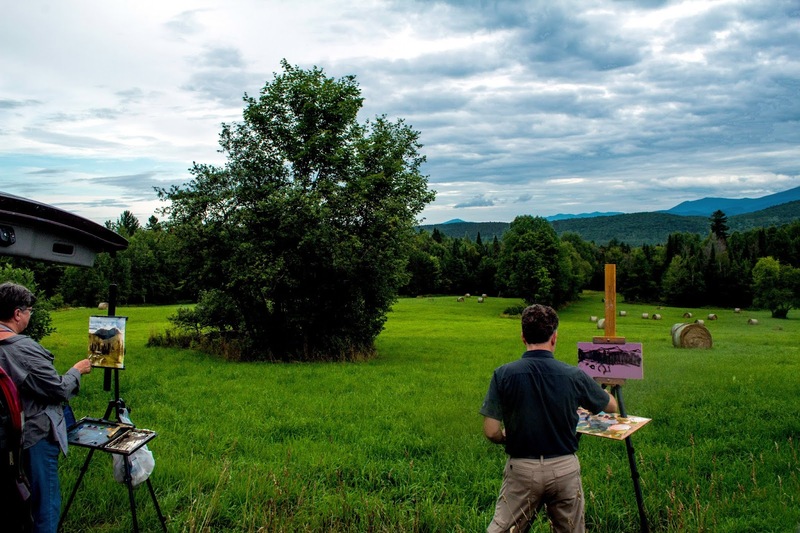 Throughout the week, wherever you were driving, you could see painters with easels capturing the beauty so alive and bountiful in this part of Adirondack Park. You might have seen them standing before a rousing and majestic many layered mountain view, it could be that you were out and away from town on any one of the many lakes in the area, or you might have been river canoeing, and again, there they were, canvas on easel, paint brushes whirling and swirling, mixing in just the right amount of paint, light, color and imagination. Heck, you could even have been sitting in a quiet corner in town, or in the center of town, walking through town? any time, day or night, and again, there they were, paintbrush releasing its magic onto canvas, bringing to life the beauty that abounds. 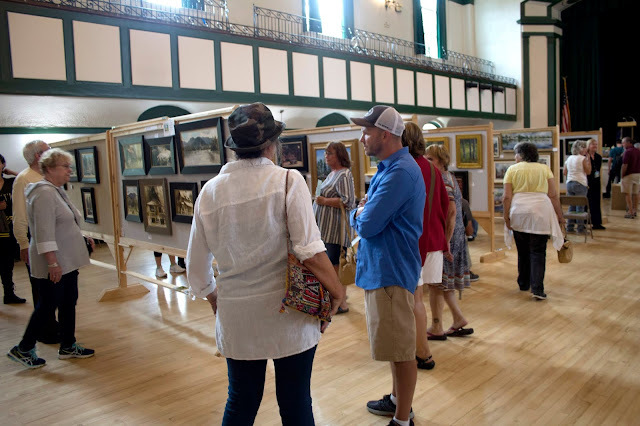 As one artist said, "It is surrounding beauty wherever you stand." 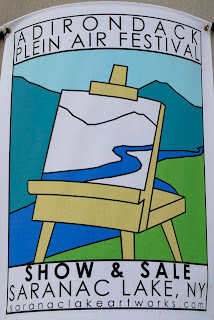 Even seeing the artists around town, without their paints and easel, you know who they are, their heads are held high, shoulders thrown back, there is strength in each of their steps, their skin shines, the hair glistens. A smile on their face. They are vibrant for life. They add to the meaning of life and living. You know they know life is a joy. They live in the moment. 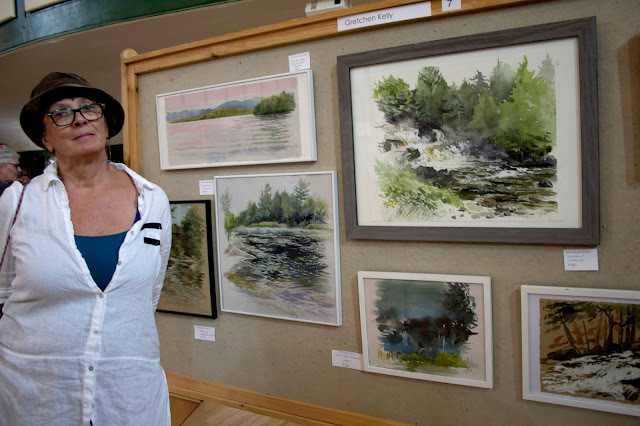 Just in case you might have missed those flashing brushes on canvas, at the end of the week all this talent and art was on display in the Saranac Lake Town Hall. And what a display. What a feast of art. Painting after captivating painting, every one of the fifty artists paintings were gathered together with each other and with their paintings. "It is taking a walk in the park," a visitor said. Indeed. When visiting with some of the artists, all were ready to add insight into their paintings and into their philosophy, enthusiastically talking about what they have brought to life on canvas. 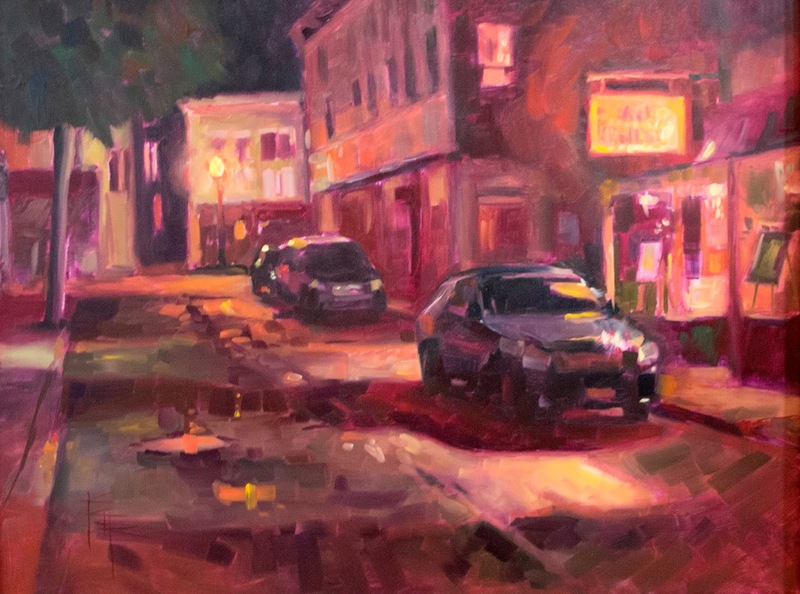 Rockport, Maine, artist, Carol Douglas said, "I like having the bottom of my pictures bright, as in this one, where the water shimmers, lifting the whole scene bottom to top. It is what I teach my students." 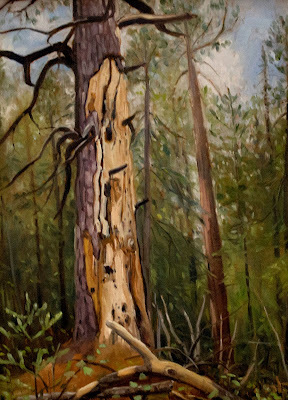 Conversely, here you have strong branches in the midst of the scene, done by Sandra Hildreth, who lives year around in Saranac Lake, pulling you into and along those branches, and then dropping your sense of it down the tree and throughout the painting. It also makes you wonder what was digging at that tree, doesn't it? 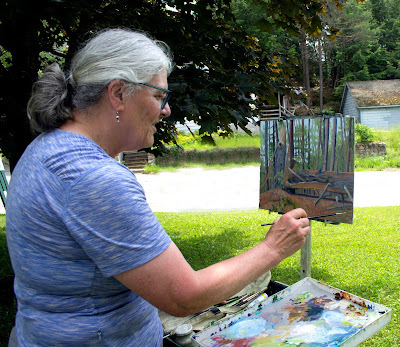 Here is Sandra at her easel. She spends much time in the surrounding forests, and doesn't just see what is before her, she feels it, becomes part of it. And lucky us, we get to see the result of her insight and talent. 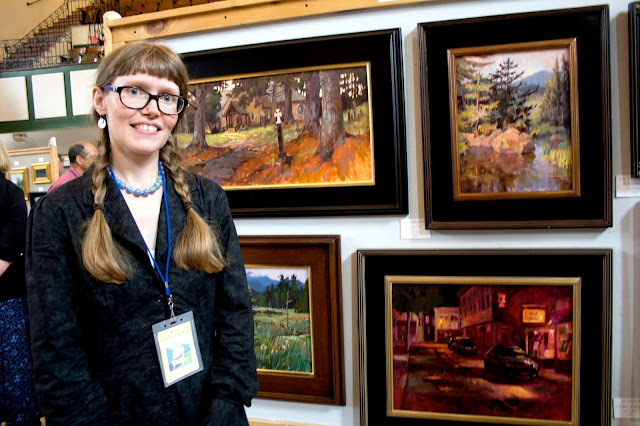 Sandra is the key coordinator of the Plain Air here in Saranac Lake. 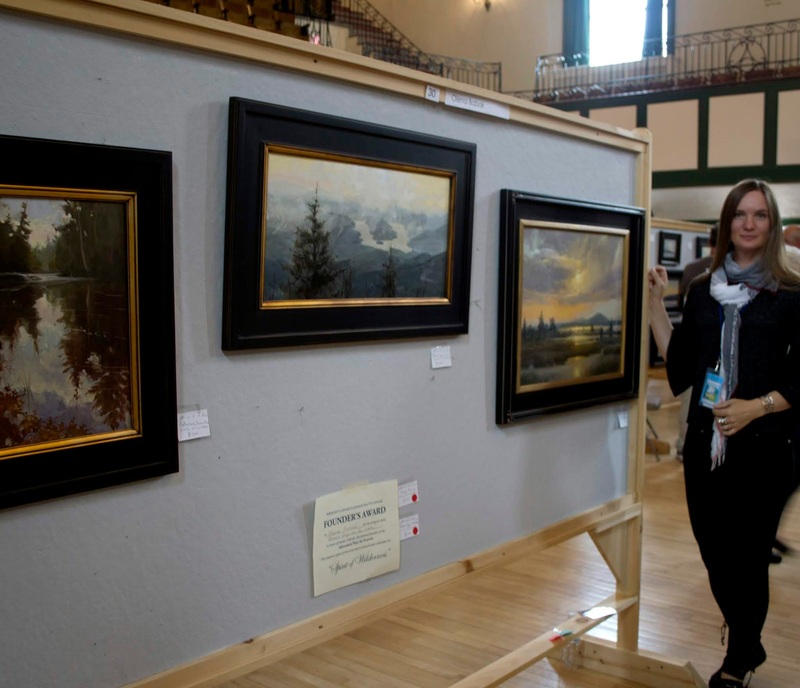 Its primarily sponsor is Saranac Lake ArtWorks. Stopped by to see Olena Babak, in from central Maine. "We obey the rules of beauty," she said. Coming into town for a different insight, you have a painting by Kari Ganoung Ruiz, "The Quiet of 5 AM". "I like working at night because I have complete control over the light, because it is set", and "I also enjoy the quiet. It is great for concentrating." This is a scene off one of the side streets in Saranac Lake. And she wasn't kidding. She started working on this at eleven at night, finishing it up at five in the morning. I was stopped by Tony Connor's work, pulled in by the radiant birch. "I love birch," I said to him. "Actually," he said, "it is pine I painted white.” "Works for me, Tony." Russian born, Nikolay Mikuskin, now living in Syracuse. "Did you really do all that this week?" I asked him. 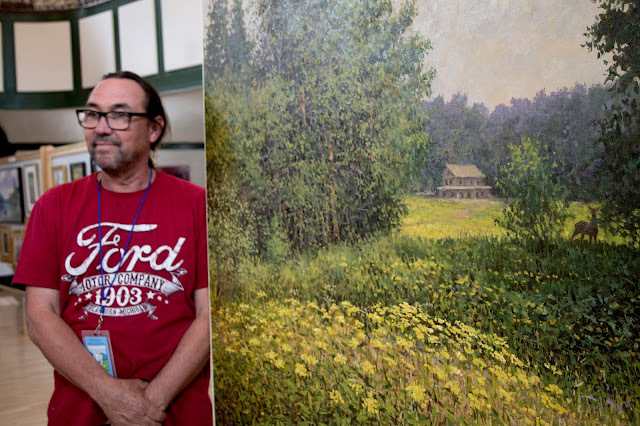 "It took me about seventeen hours, and even this morning I added some final touches to give it scale and life." "If you don't get the rocks just right, it looks it. It is hard for me to always make them work, but in the end, I think I did it this time." Yes, Gretchen, you did. with the artist's anticipation of what will be. Finally, as the day closed out and preparations for leaving began and watching all the paintings being taken from the walls, wrapped and readied to be carted off, it was sad to see and know the day was at an end, that the week was at an end, the final touches of end of an otherwise exhilarating, climactic day, and week. 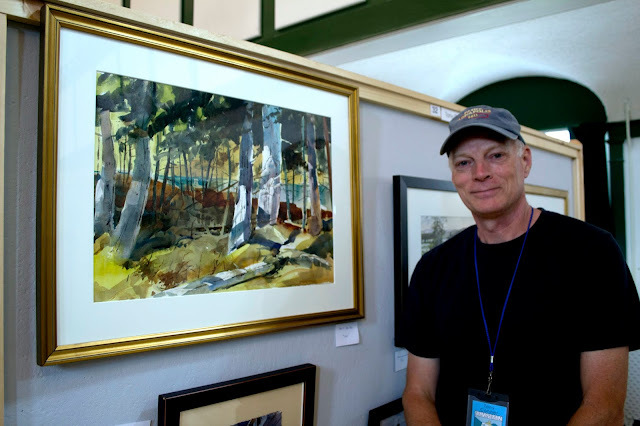 The artists themselves, worn with the amount of time, travel and effort they had put into their art, were no doubt looking forward to making their way back home, relaxing and taking time for themselves, and most assuredly looking forward to returning next year for another Plein Air Festival.